I d this printed by birthday in a box. The text says:"It may not be your first rodeo, but it is ours!" "You're invited to The Rosales Rodeo and Roundup Birthday Party!" The rest is information about the party. For the party we made the kitchen table look like a Conestoga wagon. (Sometimes I wonder about my ideas!!!) It was fun but, it took some planning. We made the frame out of pvc pipe. We covered it with muslin and added plastic wagon wheels. We used the bandanas as a table cloth. We used an old boot as a flower vase. We made a boot cake and decided that the children's "signature cake" would be cupcakes. 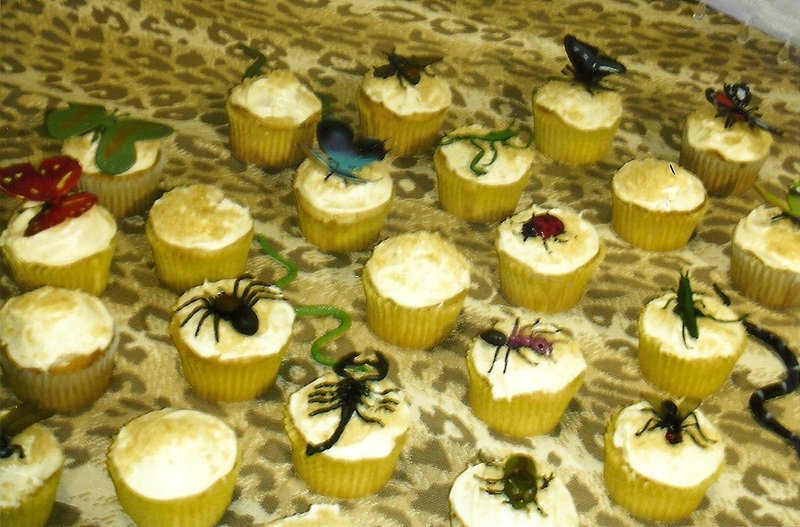 We made the cupcakes look like little bales of hay. All in all it was a great party. The triplet's second birthday party was an Elmo extravaganza. Elmo even showed up. The triplets were beatle maniacs!!! The invitation was made from a 45 record and I printed the invitation on the cover of the record. 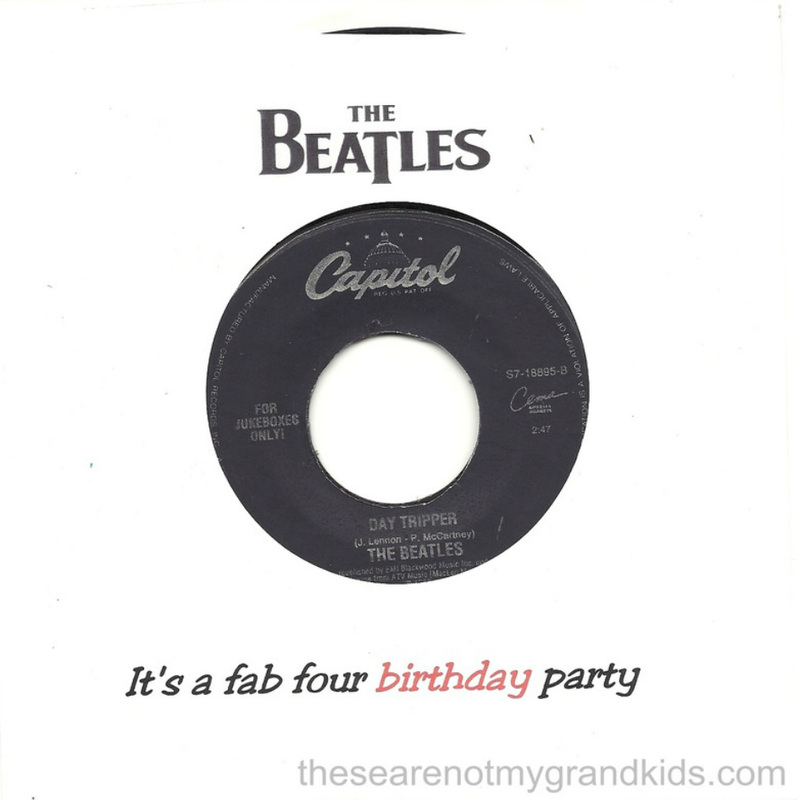 I used the titles of Beatle songs in the invitation. The words in red are Beatle songs. 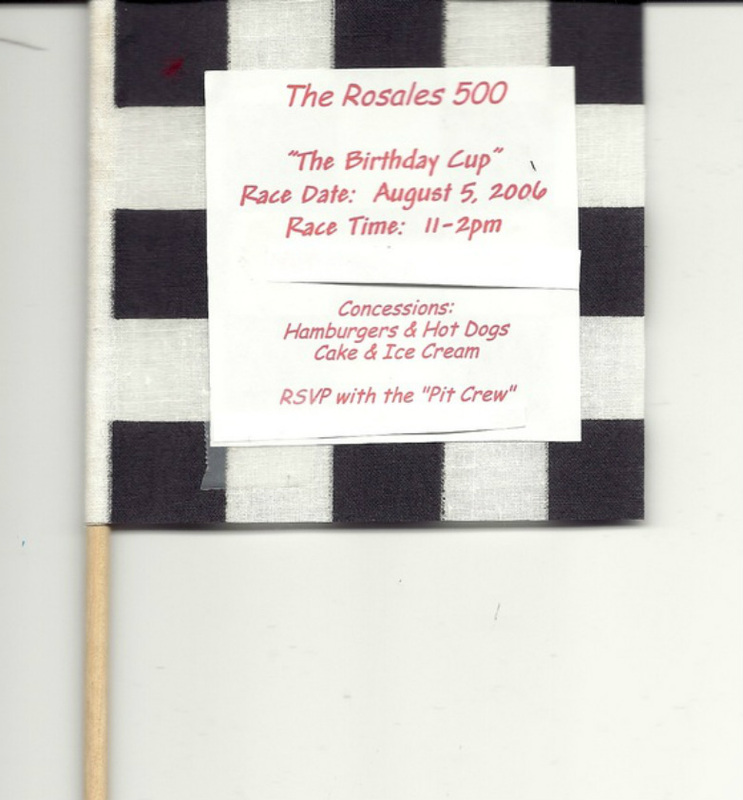 This invitation was printed on the computer and pasted to the checkered flag. 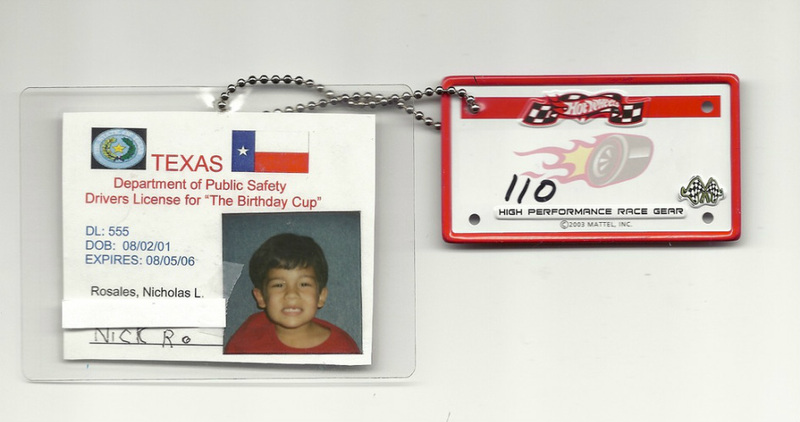 It was "The Birthday Cup" Race Date, Race Time and Concessions: Hamburgers & Hot Dogs Cake and Ice Cream RSVP with the "Pit Crew"
In advance I had made drivers liscense's for the children. I use my liscense as a pattern it had a DL#, DOB, and name and a place for their signature. When they arrived we took their picture and I laminated the liscense. They also received a hot wheels card that we put a racing number on. The triplets 5 birthday cake was a race track made from 2 8 inch cake pans and iceing. The triplets signature cupcakes were trophy's. I printed the invitation on cream colored card stock using a calligraphy font. It was a Letter of Marque. 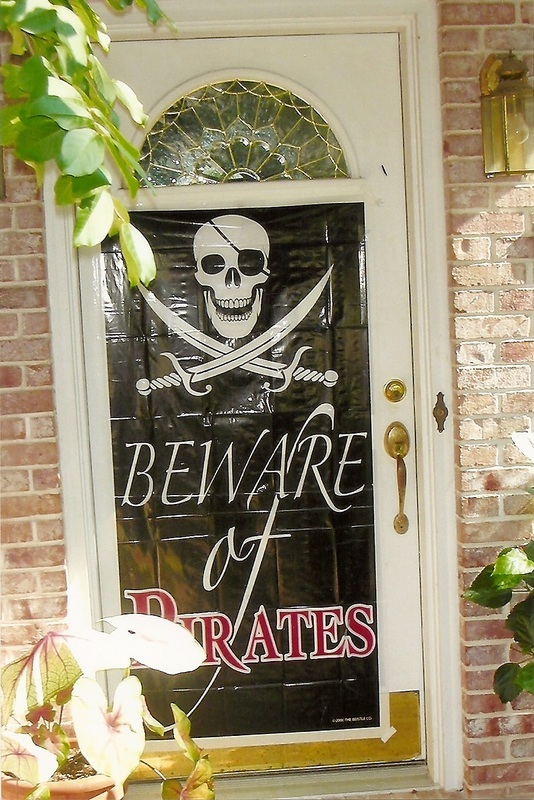 Needed Mates, Sea Dogs and Wenches to pillage swag, swab the deck, walk the plank, and toss cannon balls. The children used the names Black Beard Nick, Blue Skull, Hannah, and Evil Eye Sam.. Around the edge of the invitation I tore the paper and burnt it. These were rolled up and sent in a bottle (I got the bottles at party city). When the children arrrived they received an individual treasure map. Each child followed the map to find their own "bag of gold". We made plywood boats and the kids tossed water balloons at each other. Belinda made a treasure chest cake and bars of gold cupcakes. Gold dust on the plates. 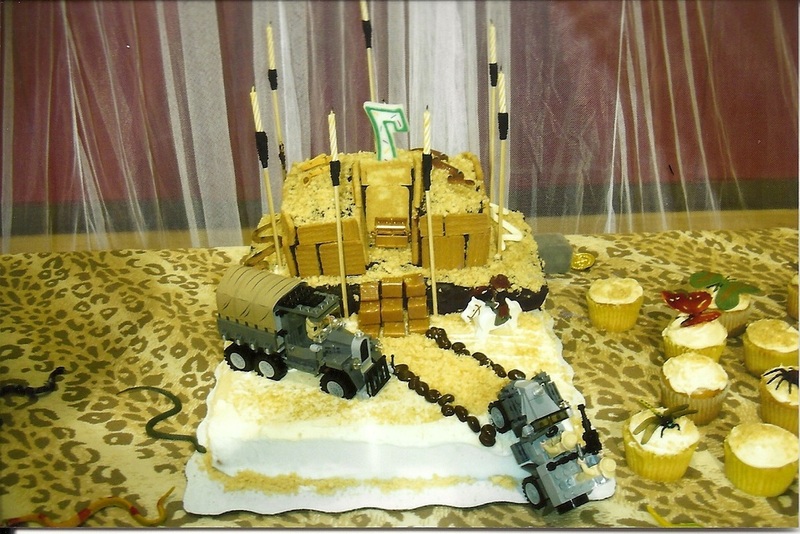 This is the table with the cake and cupckes. I used my passport as an example and made passport invitations.The children who came were to insert a picture of themselves and include personal information. They needed the passport to enter the party. They received stamps when they completed different tasks. 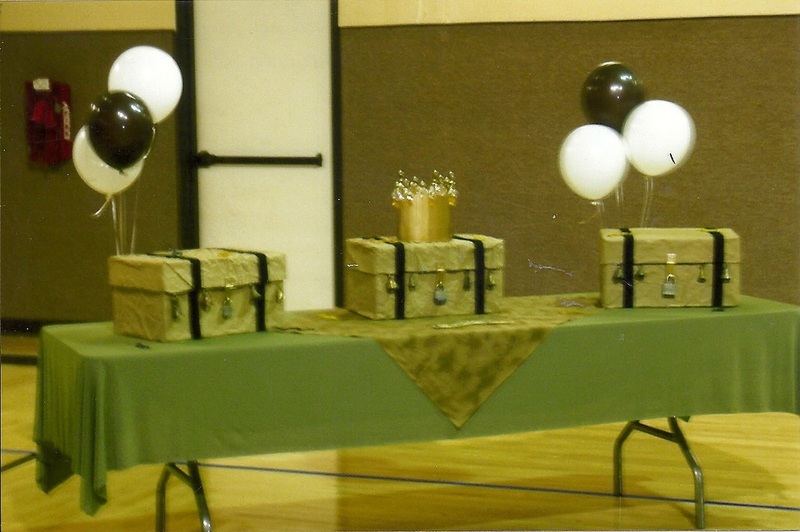 Their favors were "Indiana Jones" fedora hats and canteens. For larger pictures of Passport Invitation and How-to click here. There was a place for the childs photo. They filled in last name, first name, date of birth and gender. I also added date of issue and date of expiration (the date of the party). The next page was an Itinerary of the Archeological Expedition to Machu Picchu with the information about the party. The triplets used the names Missouri Nick, Louisiana Hannah and Arizona Sam. This was a history of Machu Picchu I typed. At the end I mentioned the Rosales University reached an agreement regarding an expidition on August 2, 2008 by Missouri Nick, Louisiana Hannah, and Arizona Sam to Machu Picchu to search for treasure and artifacts. The following page was a map of South America showing Machu Picchu. This is the statement which the children signed. The following page was Visas. This page was stamped when the children completed a task and found clues for treasure. The triplet's 7th birthday party was an adventure to Machu Picchu. An "Indiana Jones" theamed party. I sent out passport invitations. The guest had to fill them out, insert their picture and bring them to the party. The party was at our church's gym. We had set up three stations where the kids performed tasks and received stamps in their passports. They also had to find keys at each station that would open a special treasure chest for each group. It was in place of a pinata. When the guest arrived they checked in and received their party favors which were "Indiana Jones" fedora hats, and canteens. They were divided into three groups. Each group started at a different station at the same time. Then they switched to the next station as a group. Once each group had been through the three stations and had their keys they used them to open their treasure chest. After that we had lunch and then cake and ice cream. See pictures for further ideas and how-to's. The children were divided into three teams. Each team had to complete tasks and find keys that would unlock their groups treasure chest. We did this instead of a pinata. We planned a roller skating party for the triplets 9th birthday. This is the invitation to the party. The kids used the names Nicholas Rage, The H-Bomber, and Sam D. Stroyer to compete. I made the skate design out of thin card board. I printed out the information on kraft card stock and pasted it on the card board. I cut out black circles for the wheels and smaller gray circles for the inside of the wheel. I added eyelets and then threaded a brown shoe lace through the eyelets. 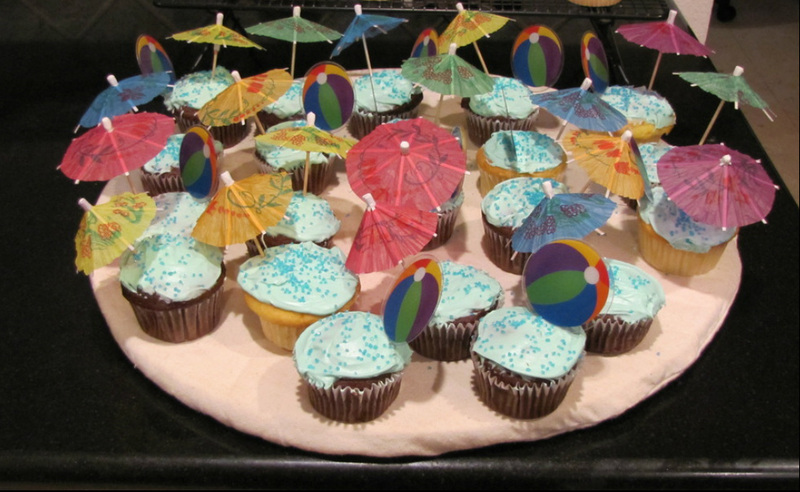 We made our signature cupcakes in the shape of a roller skate like the invitation (pictured below). Click on invitation for purchase information. 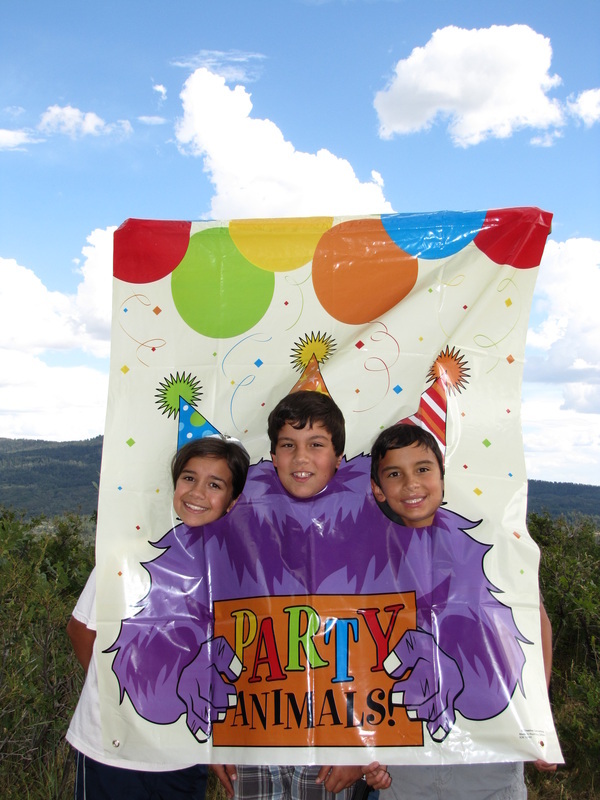 We spent the triplets 11th birthday at our ranch in Colorado. 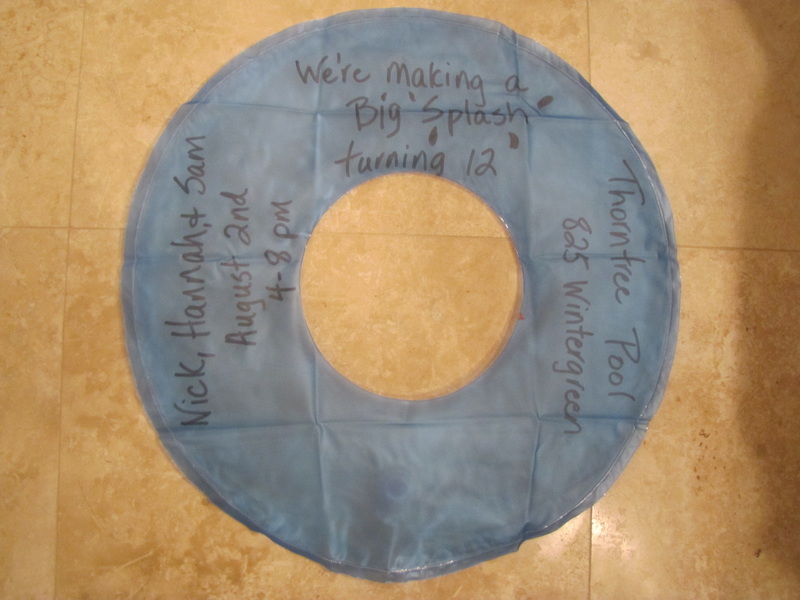 This is the invitation for the triplet's pool party. 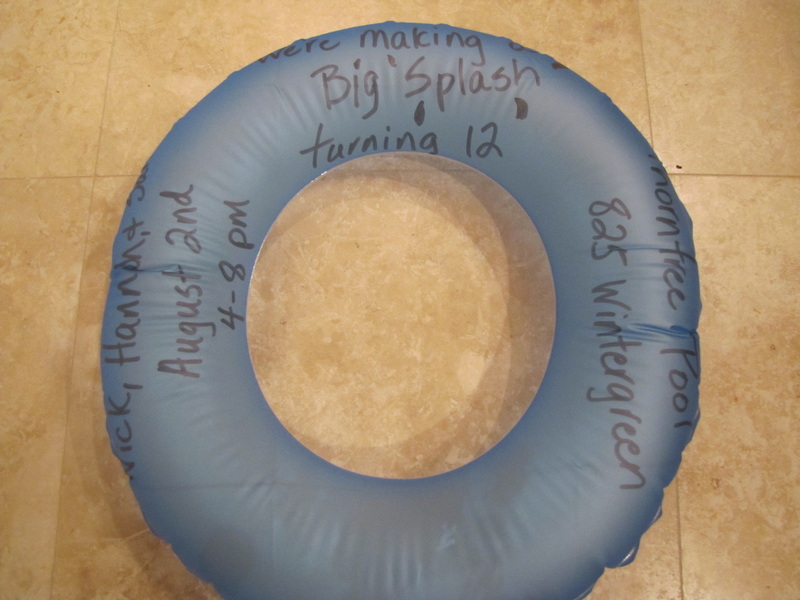 We're making a big splash turning 12. 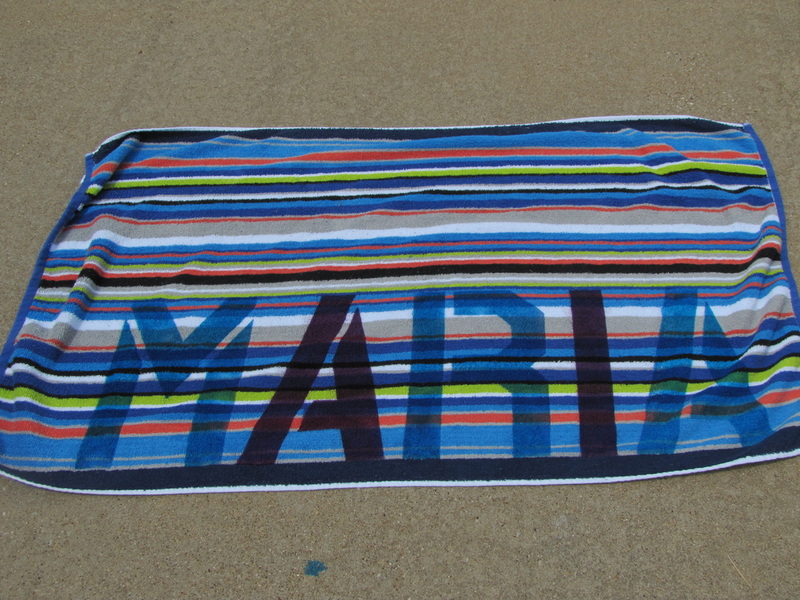 I found beach towels on sale and bought enough for each guest. I cut their names out of freezer paper to make a stencil. After I washed the towels I ironed on the freezer paper stencil. Then the kids used spray fabric dye to stencil each child's name on their towel. See the slide show for further information. 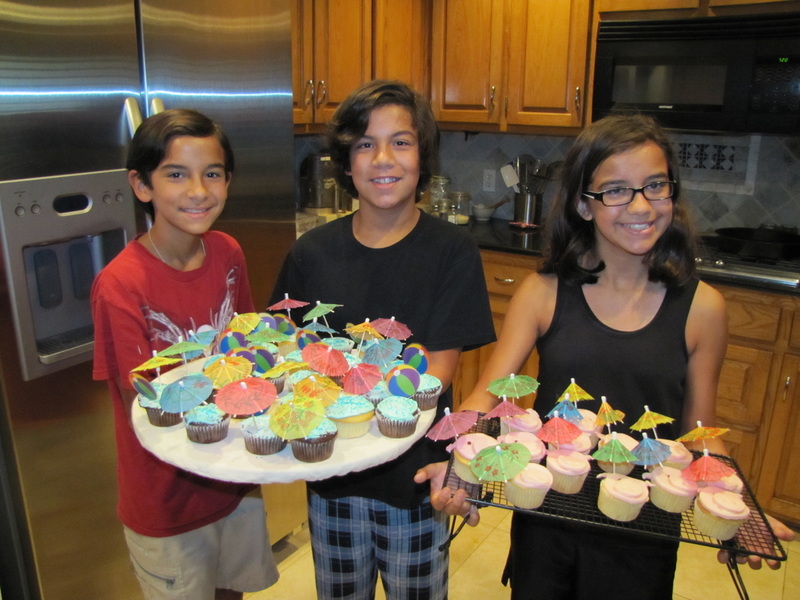 The triplet's helped make and ice the cupcakes. 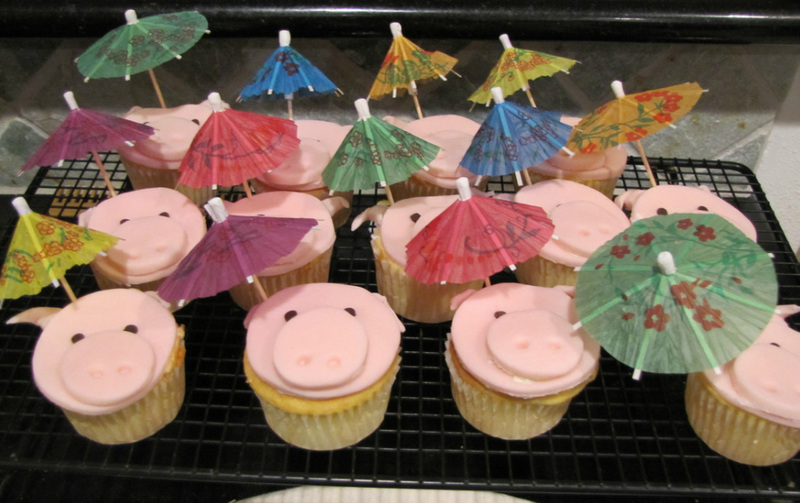 The pink ones are piggies in the sun. (Pigs are big at our house right now!) We saw this on pinterest and they turned out great. 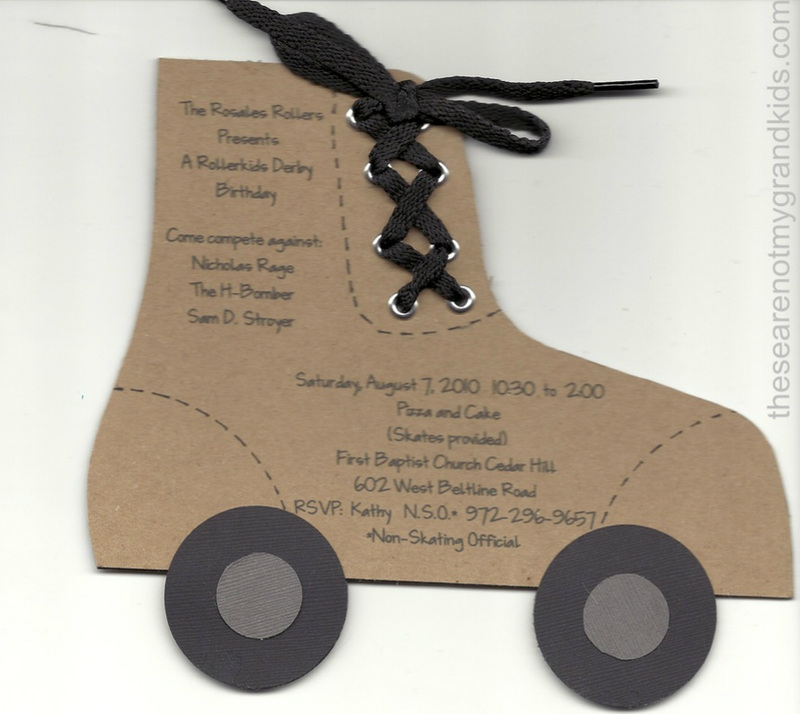 This is another view of the invitation.